The memo below is from the New Jersey Department of Education’s Assistant Commissioner of Student Services, Carolyn Marano. It was written while she was Director of Special Education at Asbury Park Public Schools. In both positions she was hired by Lamont Repollet, first in his position as Superintendent of Asbury Park and then as NJ’s Education Commissioner. It all points to a disturbing pattern of leadership that undermines the academic trajectory of children with disabilities. This memo (with names redacted) is personal to me because I am the mom of a son with special needs. If we lived in Asbury Park, his educational journey would have been far worse. Why? It’s not the staff; in fact, the Asbury Park Child Study Team members and special education staffers (both former and current) whom I’ve spoken to are devoted to children with disabilities, strive to meet their needs, and desire to follow state and federal law. But their efforts were stymied by Carolyn Marano. This memo is not the whole story, only an emblem of what went on in Asbury Park and now is occurring at the New Jersey Department of Education. Transportation shall be provided to public school students who reside remote from their assigned school of attendance, nonpublic school students who reside remote from their school of attendance and meet the eligibility criteria of N.J.A.C. 6A:27-2.2, and special education students who reside remote from their assigned school or who require transportation services in accordance with their individualized education program (IEP). How are decisions made about my child’s special education needs? ■ Reevaluation of your child. to make these determinations and develop your child’s individualized education program (IEP). 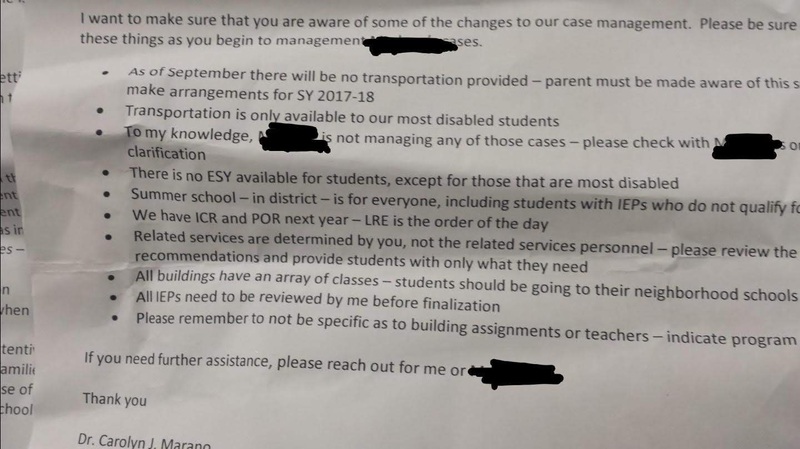 Marano continues in the memo,”There is no ESY available to students, except for the most disabled.” ESY is shorthand for “Extended School Year,” which is provided for students with disabilities who might regress during the summer. This is another service written into IEP’s. Whether or not a child is eligible for special education services during the summer is a decision made by the Child Study Team. Marano is violating statute here in two ways: first, by eliminating ESY — district-wide! — and, two, telling her staff to change IEP’s without parent consent. Next Marano writes, “related services are determined by you, not the related services professionals…and provide students with only what they need.” Actually, decisions regarding related services — speech, occupational, and physical therapies, social skills training, etc. — are made in consultation with the related services professionals and the parents of the child. No Director can issue orders like this. “All students should be going to their neighborhood school.” Hmm. In my local school district, self-contained classrooms for children with, say, autism are in several elementary schools but not all of them. According to state and federal disability law, a child must be placed in a classroom that meets his or her needs. If the neighborhood school can’t provide the necessary services to meet those needs — whether it’s a classroom with teachers certified in Applied Behavior Analysis (the most successful approach for educating children with autism) or a building with an occupational therapist (which not all Asbury Park buildings have) — then the child can’t be placed in “their neighborhood school.” And, anyway, placement, as cited in the Parental Rights excerpt above, is a decision reached with the entire Child Study Team and, most importantly, the parents. “All buildings have an array of services.” Actually, in Asbury Park they don’t. For example, I’ve been told by several sources that the middle school, at least during Marano’s tenure, had no occupational therapist. She’s just making stuff up now. “All IEP’s need to be reviewed by me before finalization.” Of course the Director of Special Education has the power to review all IEP’s. In fact, he or she should. But here’s the thing: She can’t make changes without calling a full IEP meeting with the parents and all related professionals. And, really, she can’t make changes at all: The Case Manager (the head of the Child Study Team) has the power to make decision about services without consulting the Director. This is probably more than you wanted to know about the development of IEP’s and the power of parents in the process. So here’s the point: What Marano did in Asbury Park — denying services to children with disabilities, interfering with statutory processes, cancelling district-wide required programs like Extended School Year — hurts children and families and violates the law. She didn’t operate with complete autonomy because she had a boss who both evaluated her annually and was accountable for her performance. That person was Lamont Repollet, now your State Education Commissioner. And now she’s his Student Services Director. What the pair did in Asbury Park they can now implement statewide. And I’ve been told that the two still run Asbury Park long-distance. Then Repollet and Marano arrived. At one point either Marano or someone appointed by her (one person said that Repollet was either present or involved) entered the storage rooms that held supplies for the Early Childhood program and raided it. “They went on a shopping spree,” a source told me. They took furniture, printers, cooking carts, toaster ovens and brought them to the Central Office. Then they changed the locks. These were supplies purchased through Fund 20 appropriations. 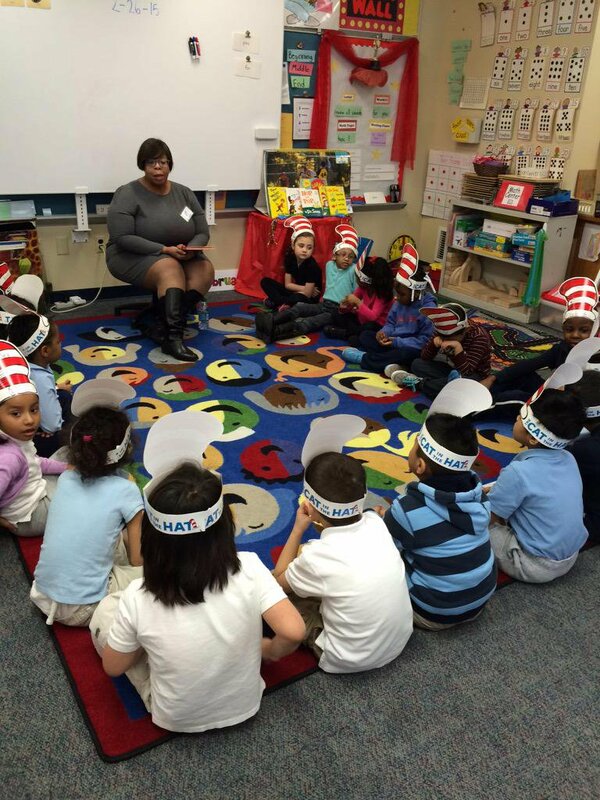 What did Superintendent Repollet do?, I asked. Meanwhile at the State Department of Education, Carolyn Marano is continuing to eschew accountability, misallocate funds, transfer staff willy-nilly, and decimate staff morale. Just like she did at Asbury Park. Nothing changes if nothing changes. And so we’ll wait. Next PostShould Gov. Murphy Take Advice From Newark Teacher Union Prez John Abeigon on Charter Schools? Depends On How You Feel About Blackface.